Observation - Heath Navel - UK and Ireland. Description: Small (c 1cm cap diam) slightly funnel shaped. Decurrent gills. Curved stem. On rotting wood. Small (c 1cm cap diam) slightly funnel shaped. 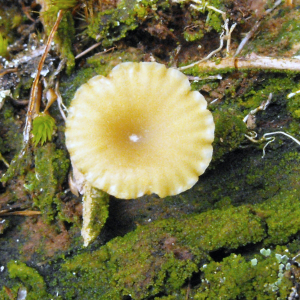 Decurrent gills. Curved stem. On rotting wood.